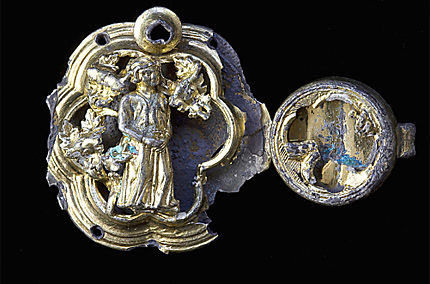 The body of a young woman felled by a blow from a Roman sword was discovered near Faversham, Kent. Archaeologists were excavating the area to prepare for future roadworks when they came across the hastily-buried remains. The girl appears to have been between 16 and 20 years of age when she died, kneeling, stabbed in the back of the head by a Roman sword. Some pottery fragments of Iron Age grave goods buried along with her date the grave to 50 A.D., just seven years after the Roman conquest of Britain began in 43 A.D. In all likelihood she was one of its local victims. “She was lying face down and her body was twisted with one arm underneath her body. One of her feet was even left outside the grave,” [Dr. Paul Wilkinson, director of the excavation] said. Another indication of her origin, according to Dr Wilkinson, is the orientation of the body. Romans buried their bodies lying east-west, whereas this body was buried north-south, as was the custom for pagan graves. 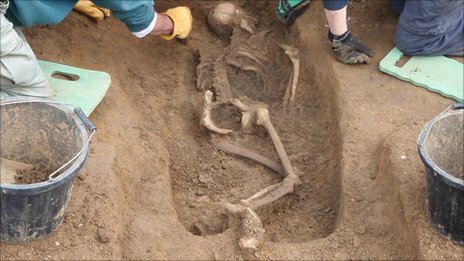 In keeping with controversial new Ministry of Justice guidelines instituted in 2008, the skeletal remains of this girl will be reburied on site once the archaeological team have finished their examination. The Ministry of Justice grants licenses for archaeological excavation of human remains. Before 2008, licenses were granted that allowed researchers to retain, study, curate and display ancient excavated remains as appropriate. Only more recent graves were required to be reburied promptly. In 2008, they changed the standard so that now licenses are granted solely on the condition that all human remains excavated at digs in England and Wales are reburied within two years, no matter what the age of the remains. Archaeologists are protesting the new guidelines vociferously, pointing out that human remains continue to be studied for decades, even centuries, as new scientific techniques are developed that can provide us new information about our ancestors’ lives and deaths. The ruling was supposed to be an “interim measure,” part of a reassessment of the relevant act (the Burial Act of 1857), but now three years after its implementation, there are a large number of extremely important ancient remains that will have to be forcibly re-interred, like the 51 decapitated Viking warriors found in July 2008 in a mass grave near Weymouth, Dorset. Bored out of your mind with every TV talking head spending all day on the minutiae of today’s royal wedding? They never talk about the things I’m interested in, like explaining all the geegaws on the uniforms or how the glorious medieval Cosmati mosaic floor in Westminster Abbey’s sanctuary is packed with apocalyptic symbolism, or what was up with that one riderless horse bolting out of the procession (the horse was spooked by the crowd, dumped his rider and ran straight home; cavalryman was unharmed except in his dignity). For those of us who like our historical context in great gouts, here’s a little consolation. First enjoy a couple of neat YouTube videos from the Historic Royal Palaces channel, one of the most consistently entertaining and well-maintained history-themed YouTube channels ever. This first one features food historian and leader of the HRP’s historic kitchens team Marc Meltonville talking about the history of royal wedding cakes. Next up is curator Dr. Joanna Marschner who discusses the past two centuries of royal wedding fashions. The dresses are from the Royal Ceremonial Dress Collection at Kensington Palace. My personal favorite slice of royal wedding history, though, is this exhibit of biting Georgian satirical caricatures which took delight in mocking the marriages of George III’s daughters to their large German husbands. The exhibit marks the 250th anniversary year of George III’s coronation, and is appropriately hosted in Kew Palace, the family’s country retreat. Queen Charlotte, George III’s wife, died there, with her son the regent and future King George IV by her side holding her hand. Kew Palace is also where the daughters of George III lived, often far longer than they would have wished. George and Charlotte kept their daughters as sheltered and homebound as possible, the King finding political pretexts to reject suitor after suitor, then the Queen wishing to have her daughters with her when their father descended into his famous madness. Out of their six daughters, only three ever married. Charlotte, Princess Royal, was the youngest at 30, which wasn’t very young at all in 1797. She was the only to marry during George III’s lucid reign. Princess Elizabeth was 48 and Princess Mary 40 before they were finally able to get married and live their own lives. By then their brother George had been regent for years. Those late-in-life marriages and the three unmarried sisters, Princesses Augusta Sophia, Sophia and Amelia were therefore ripe subjects for satirists. 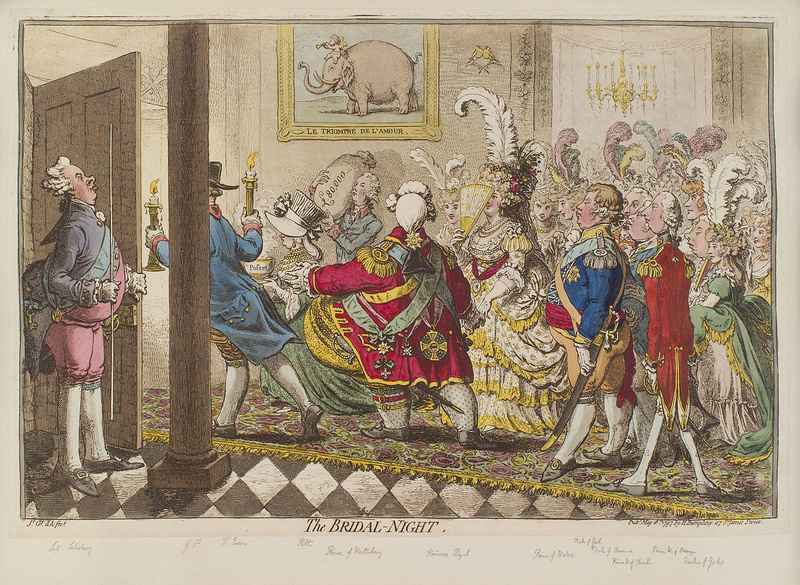 James Gillray’s ‘The Bridal Night’, published in May 1797, depicts the marriage of Charlotte Princess Royal, the eldest daughter of George III, to Frederick Duke of Wurttemberg. Dubbed the “Bellygerant” and described by Napoleon, “that God had put him on earth to see how far skin could stretch…”, Gillray depicts Frederick as quite unfeasibly fat, and cheekily represents the wedding night with a cherub sat atop an elephant. Archaeologists excavating an area where a bridge is scheduled to be built between modern-day Ostia and Fiumicino, the town just outside Rome where Leonardo da Vinci airport is found, have discovered the remains of an ancient Roman ship. The 11-meter (36-foot) section is from one of the sides of the ship. So far neither the stern, bow nor hull have been recovered, but since we’re talking about ancient wood, the team is working very deliberately to ensure its preservation. She also said there were “remains of ropes and cables” in the ship. “Restoring the vessel will be an extremely delicate operation,” Moretti went on. “We’re keeping it constantly covered in water so that the wood doesn’t dry out. “The wreck must be treated with highly sophisticated preservation techniques,” Moretti said. I hope they have a giant freezer available somewhere, because the polyethylene glycol dousing system that preserved the likes of the Mary Rose and the Vasa is way too expensive with oil prices the way they are. According to site director Paola Germoni, the discovery of the ship at this location indicates that the ancient coast line was 4 kilometers (2.5 miles) further inland than it is today. Silting gradually filled the port and the mouth of the Tiber shifted, pushing back the shoreline so that the ancient city of Ostia, now called Ostia Antica, is miles away from the modern beach town of Ostia. 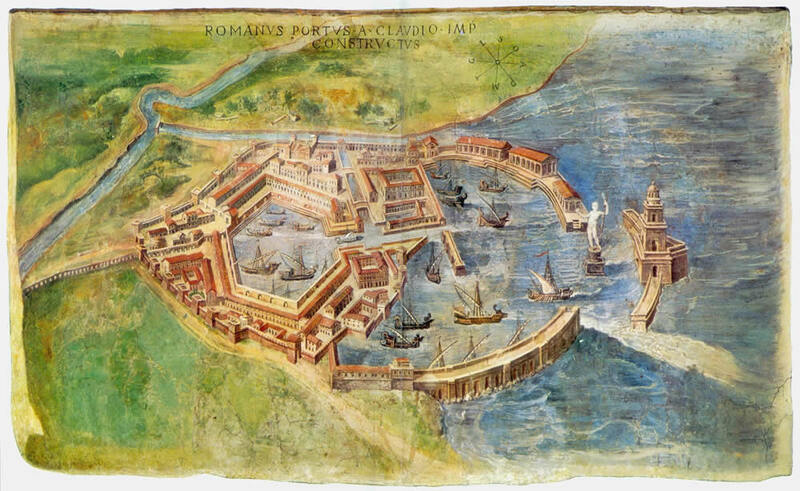 You can see how the river and shoreline moved in this post about Portus, the artificial harbour first constructed next to Ostia’s smaller natural harbor by the emperor Claudius. Roman ships were found before in this same area when the airport was being built. The small fleet and the artifacts found with them are now on display in Fiumicino’s Museum of the Roman Ships. 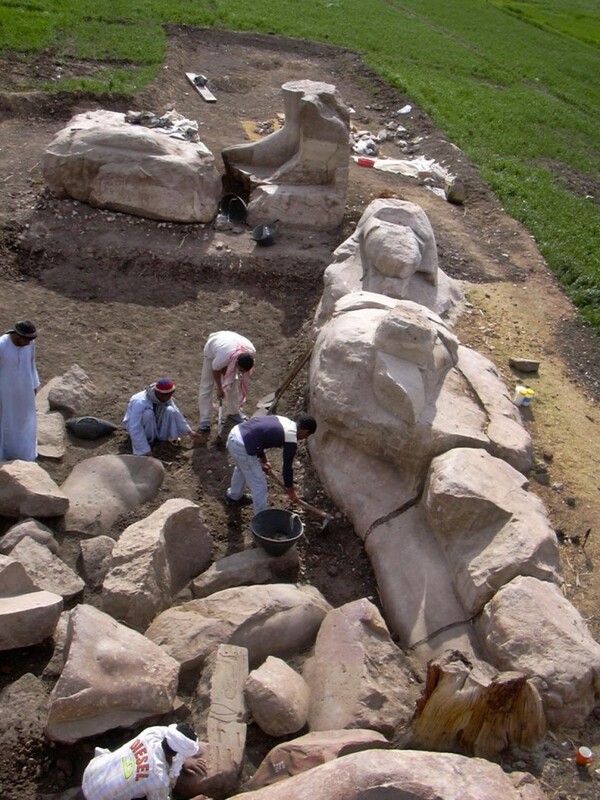 Archaeologists excavating Amenhotep III’s mortuary temple in Luxor have uncovered a colossal statue of the pharaoh. It’s 42 feet tall (13 meters) and consists of seven enormous blocks of quartzite. The head hasn’t been found yet, but they’re looking for it, so this giant may turn out to be even more of a giant than he is now. As it is, this 3,400-year-old statue is the largest of its kind ever found in North Africa. The statue is apparently one of a pair that once flanked the northern entrance to the temple. They are thought to have been brought down by an earthquake in 27 B.C. which severely damaged the temple. The matching statue has not been found yet, but this isn’t actually the first time these colossi have come to light. The pair was first discovered in 1928, only to be reburied at the site under sand for their own protection. The team hopes to find the second colossus in the next digging season. Meanwhile, the blocks are being cleaned and restored in the hope that they can be reassembled at their original location. Archaeologist Abdel Ghaffar Wagdi, supervisor of the 7-month excavation, announced that two other statues have also been found. They’re less dramatic in scale, however. One is an intact black granite statue of the lion-headed goddess of healing, Sekhmet. She is six feet tall. The other is a statue of the baboon god Thoth. There have been an abundance of Sekhmet statues found at Amenhotep III’s temple, leading some archaeologists to conclude that the pharaoh was ill towards the end of his life, possibly from arthritis, and made regular offerings to Sekhmet for her protection. Amenhotep III was the seventh pharaoh of the 18th Dynasty, reigning from 1391 B.C. to 1353 B.C. He was the father of Amenhotep IV, later known as Akhenaten, and the grandfather of King Tutankhamun. 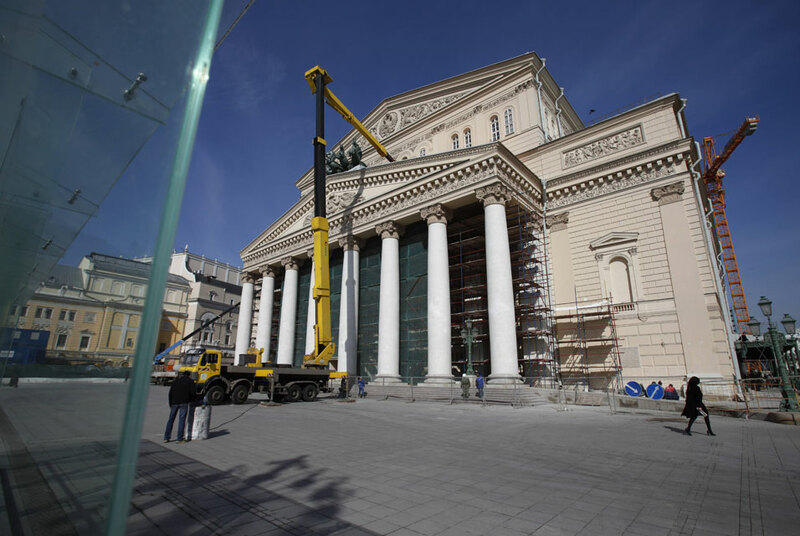 Moscow’s Bolshoi Theater is finally set to reopen in October after over six years of troubled reconstruction. The theater was originally scheduled to reopen in 2009, but the date was pushed back repeatedly under a cloud of accusations of subcontractor improprieties. It looks like the end is finally in sight, however, and judging from the pictures, the new old Bolshoi will be gorgeous, which it better be because it has cost roughly $660 million, 16 times over the original estimate. 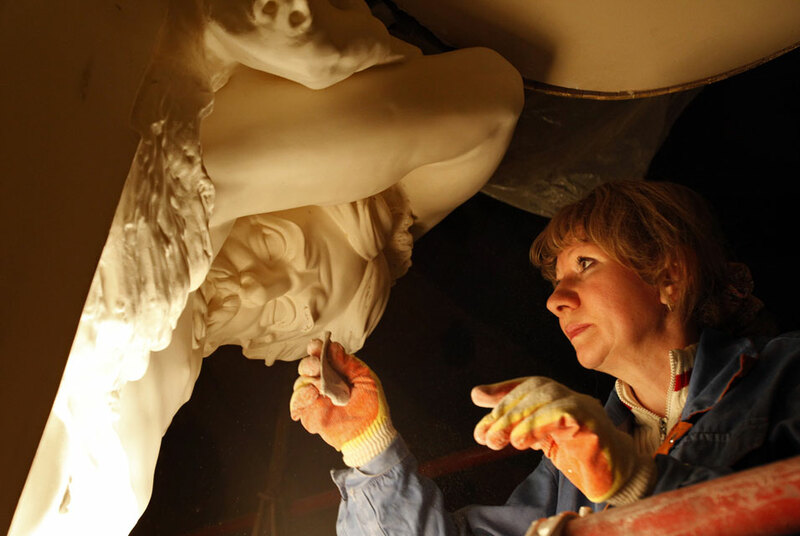 This makes the third major renovation the theater has seen since it opened in 1825 as the Imperial Bolshoi Theatre of Moscow. The first one was after it burned down in 1853 leaving only the exterior walls and the main colonnade standing, and the second after it was bombed during World War II. This reconstruction is the biggest of them all since it involves a complete rebuilding from the ground up — architects estimated that a full 75% of the structure was in precarious condition — removing the bizarre and inexplicable alterations the Soviets abused the poor building with, and restoring all the decorative elements, from red velvets to coats of arms, to their glamorous tsarist origins. Given all that, it’s perhaps understandable that this restoration has taken more than twice as long as the 1853 one. I’m sure the whole massive embezzlement and fraud situation and the government having to fire and replace several shady subcontractors didn’t help either. The company said some 3,500 construction workers are still busy adding sophisticated electronic and hydraulic devices, redesigning the stage floor to ease the ballet dancers’ pain and completing an underground stage located just 30 meters (yards) from a metro station. Soviet founder Vladimir Lenin wanted to close the ornate theater, which he saw as a symbol of decadent aristocracy, but the Communists ended up using the theater for party gatherings. Lenin’s death was announced from the theater’s stage, and the troupe was twice awarded the Order of Lenin, the Soviet Union’s highest award. While the ballet and opera corps enjoyed generous benefits and tirelessly toured the world, the building’s acoustics were crippled by the remodeling of the hall and the filling of a gigantic hollow resonator under the orchestra pit with concrete. Not just the acoustics were crippled by that crazy concrete fill. The stage was raised and glued to the block leaving no give whatsoever in the floor. The original wood floor was flexible, built on nine wooden supports. It not only resonated along with the music, but it provided an appropriately enveloping surface for dancing. Since the 1920s, the world-famous dancers of the Bolshoi Theater have had to dance on concrete in their headquarters. This is not kind to their already busted feet. The Soviets also lifted the orchestra platform, installed the electric house lighting apparatus under the stage and extended the stage floor over the orchestra pit, thereby ensuring that a good chunk of the pit was inaccessible to the orchestra. That made some operas impossible for the Bolshoi to stage, like most of Wagner’s repertoire and a goodly portion of Strauss’s, because they couldn’t seat all the necessary instruments. The reconstruction has also rebuilt the wooden ceiling above the audience. It was originally a hanging ceiling that vibrated and reflected sound, distributing the sound evenly all over the house. The Soviets tightened the soundboard to the framework, which is the architectural equivalent of squashing the back and front of a violin together and expecting it to play anyway. Why they did all this crazy stuff, I do not know, but I suppose we should be glad they didn’t just knock the whole thing down like Lenin wanted. 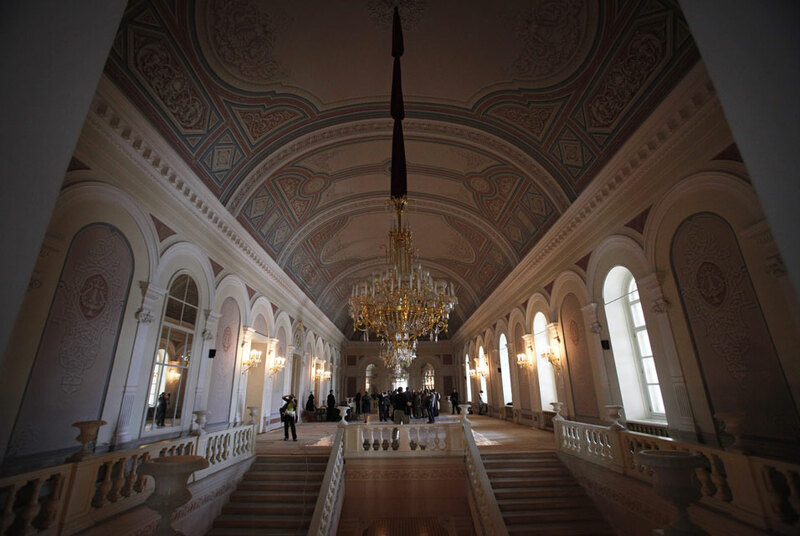 The theater is scheduled to open on Oct. 2, 2011 with a production of Glinka’s 1842 opera Ruslan and Lyudmila based on Pushkin’s epic poem of the same name. 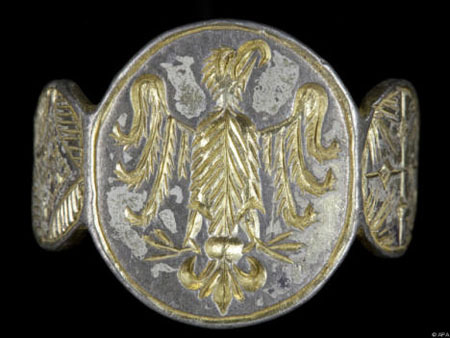 In another happy story of someone putting historical value above personal wealth, an Austrian man has found 200 pieces of centuries-old jewelry in his backyard in Wiener Neustadt, south of Vienna, the Austrian Federal Monument Agency (BDA) announced Friday. He was digging to expand a pond in his garden in 2007 when he came across hundreds of these pieces that were encrusted with moist clumps of earth. He put them in a box in the basement and forgot about them for a couple of years. 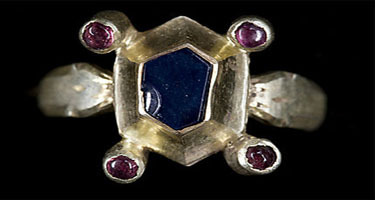 When he came across them again while packing up his belongings after selling his house, some of the dirt had dried up and fallen off, revealing the presence of precious metals and gems. He cleaned them further with common household cleansers (don’t try this at home, kids) and posted pictures of the jewels on the Internet. Collectors told him they could be very old and valuable. An amateur archaeologist encouraged him to report the discovery to the BDA, so he packed them in a plastic bag and brought them to the Monument Agency. 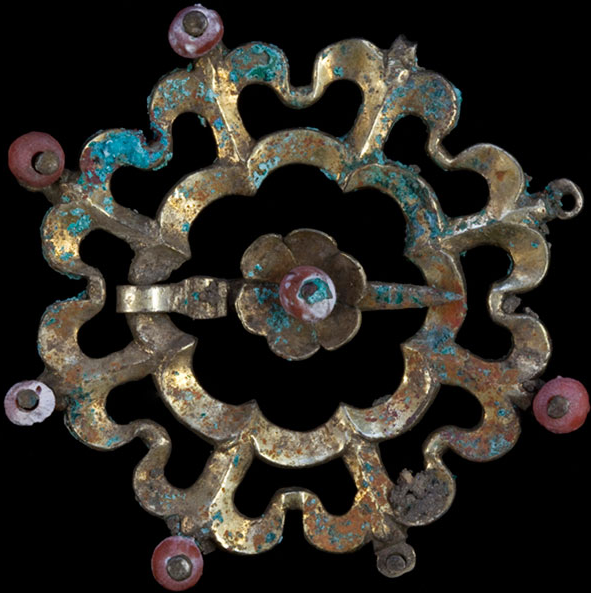 Austria’s department in charge of national antiquities said the trove consists of more than 200 rings, brooches, ornate belt buckles, gold-plated silver plates and other pieces or fragments, many encrusted with pearls, fossilized coral and other ornaments. It says the objects are about 650 years old and are being evaluated for their provenance and worth. While not assigning a monetary value to the buried bling, the enthusiastic language from the normally staid Federal Office for Memorials reflected the significance it attached to the discovery. The monetary value will only be assessed after all the research on provenance and materials has been done, but the finder, who wishes to remain anonymous, has no intention of selling. 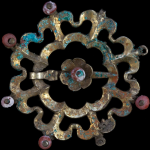 He wishes to make this beautiful and historical cultural patrimony available to the public. 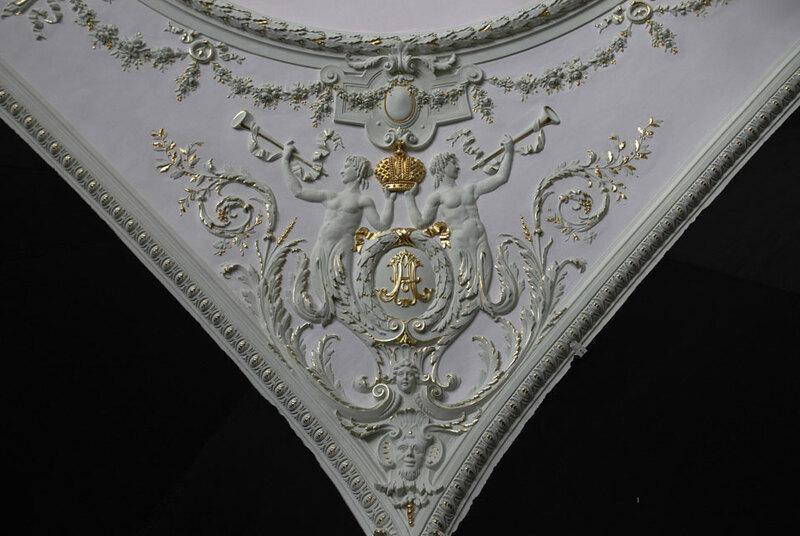 Many of the jewels will be presented to the public on May 2 in Vienna’s Hofburg Palace complex, the official residence of the President of Austria, the seat of government, and a museum showcasing imperial Hapsburg history. Roger Kent, associate director for television at Western Illinois University, had a framed portrait of Abraham Lincoln on the wall. It was a picture on cardstock set in a cutout on a red matte. Across from the picture was another cutout around a signed note. Kent had had it hanging on the wall for nearly two years, after fishing it out of the university television station’s prop room where it had languished ever since the University Union Lincoln Room was redecorated and UTV received several of the Lincoln-themed artifacts for use as set decoration four or five years earlier. 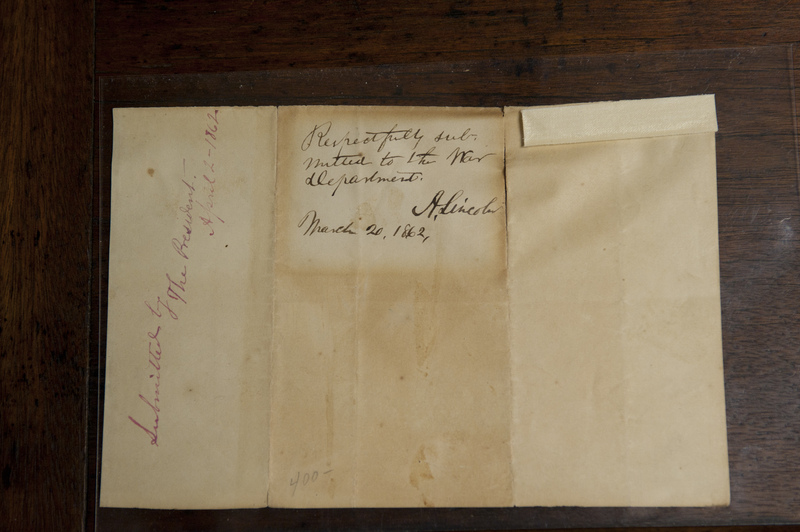 Something inspired him to inspect it carefully this year, and that’s when he realized that the writing in the cutout was a note describing the enclosed as a war department document, signed A. Lincoln and dated March 20, 1862. He sent a scanned image of the note to the curator of the Lincoln Collection at the Abraham Lincoln Presidential Library and Museum, Dr. James Cornelius. Dr. Cornelius said that at first look it appeared authentic, but that of course he needed to see it in person to assess it properly. On March 23, Kent drove 90 miles to Springfield with the portrait, where Cornelius and other curators and archivists carefully removed the document from the frame and matte. 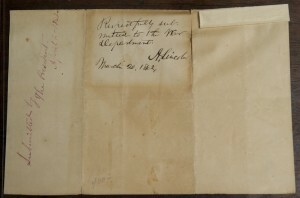 They saw then that the little note was written on the back of a document jacket that had once been folded into thirds, enclosing the document referred to in Lincoln’s note. Comparing it to other Lincoln autographs from the same period, they declared the signature authentic and estimated its market value between $15,000 and $20,000. Naturally the curators at the Abraham Lincoln Presidential Library and Museum would have loved to have added it to their collection, but Roger Kent thought it should remain at Western Illinois University where it was found. 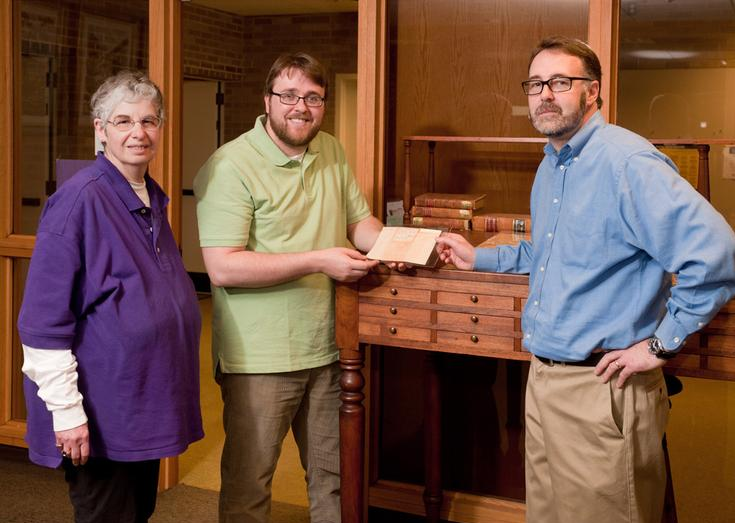 “I decided this was something that belonged in Western’s Archives, so I got in touch with Archives and Special Collections Director Jeff Hancks and Senior Library Specialist Kathy Nichols. Of course, they were more than happy to have this piece for WIU’s collection,” [Kent] added. “Roger bothered to take an interest in something that probably narrowly escaped a dumpster at one time, and he salvaged a priceless piece of history. Then he took it upon himself to have the signature evaluated by an expert, and finally, he returned the engraving and signature back to Western,” she said. Kent officially presented the document to the WIU Archives on Monday, April 11th, the day before the 150th anniversary of the attack on Fort Sumter. “Dwelling in the Fuchun Mountains,” a 20-foot long handscroll inked by revered Yuan Dynasty landscape painter Huang Gongwang between 1347 and 1350, has been in two pieces for over 300 years. The first and smallest section (about 20 inches wide), renamed “Broken Mountains,” currently resides in the Zhejiang Provincial Museum in Hangzhou, mainland China. The much larger second section, known as the “Master Wuyong Scroll,” is in the National Palace Museum in Taipei. Thanks to a memorandum of understanding signed in January by both museums, Zhejiang Provincial Museum will fly “Broken Mountains” to Taipei in May and both sections will reunited in an exhibit at the National Palace Museum from June 1st to September 25th. 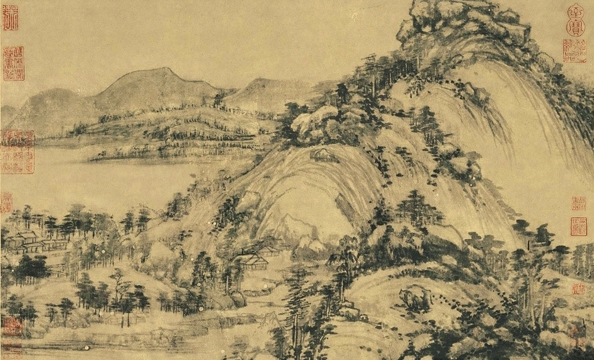 This idealized depiction of the Fuchun Mountains is one of Huang’s few surviving works and is considered his greatest masterpiece. It’s also one of the ten most famous paintings in Chinese history. Huang painted it at the end of his life as a gift for a fellow Taoist named Master Wuyong. A century later it was acquired by Ming Dynasty painter Shen Zhou and thus began its checkered journey. Shen Zhou sent it to a calligraphist to have it inscribed (nobody knows why since he himself was a famously accomplished calligraphist) and the calligraphist’s son stole the painting and sold it on the black market. When it emerged on the market for sale, Shen Zhou couldn’t afford it, so he made a copy, an excellent copy, as it happened, which is highly acclaimed in its own right and is now in the Palace Museum in Beijing. Shen Zhou gave the copy to a friend, Fan Shunju, who was able to locate and purchase the original for an exorbitant price. Fan had Shen inscribe the whole story of the theft and copy on the original. After that, the painting passed through various hands until it was bequeathed to one Wu Hongyu during the early Qing Dynasty (second half of the 17th century). Wu loved it so much he had it burned on his deathbed so it would be with him in the netherworld. Thankfully, his nephew Wu Jing’an rescued the handscroll from the flames, but it was burned in parts already and had been torn in two. That’s where the two pieces parted ways. “Broken Mountains” belonged to a number of private collectors until painter Wu Hufan got it during the Second Sino-Japanese War (1937-1945). It went from Wu to the Zhejiang Provincial Museum where it remains today. The “Master Wuyong Scroll” was owned by a number of court officials, eventually making its way to the Imperial Palace itself. Emperor Qianlong (reigned 1736 to 1796) was convinced it was a forgery, however. He fancied himself quite the expert and was sure that a copy he already had was the original and that the original was a copy. Since he was the emperor people agreed with him, and the error wasn’t corrected until well into the reign of his son, Emperor Jiaqing, in 1816. After the Kuomintang lost the Chinese Civil War (1947–1949), the scroll was brought to Taiwan along with over half a million rare ancient artifacts and books from the Palace Museum and Central Museum in Beijing and Nanking. China still claims Taiwan as part of its territory and although this has been and continues to be a source of tension, over the past three years relations have been warming thanks to Taiwanese President Ma Ying-jeou’s campaign of detente. The MOU is another step in the process. Chen Hao, director of the Zhejiang Museum, hopes that Taiwan will reciprocate and send the Master Scroll to Zhejiang so the reunited masterpiece can be displayed in mainland China as well. 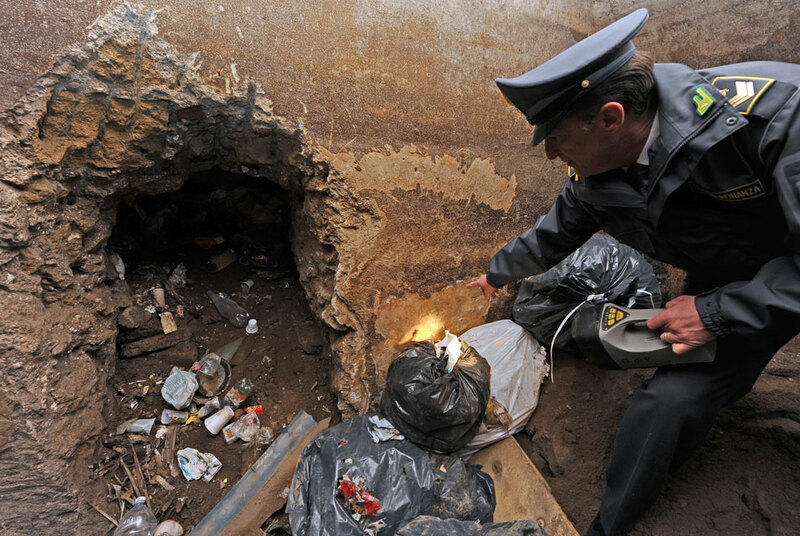 Police have uncovered a 2nd century Roman mausoleum beneath 60 tons of trash at an illegal toxic waste dump outside of Naples. The dump is on the grounds of a 17th-century tower in the coastal town of Pozzuoli, just west of Naples, a town which was called Puteoli in Roman times from the Latin word “putere” meaning “to stink.” Back then the name came from its location right in the middle of the Phlegraean Fields, a caldera that includes the dormant Solfatara crater that regularly emits jets of sulphurous fumes, although it applies even more today given the enormous problem of illegal garbage piles plaguing the area. When police raided the dump, they employed earth-movers to clear and impound the trash. They found an area where parts of the 17th century tower appeared to have been intentionally ruined so the rubble could disguise the trash. 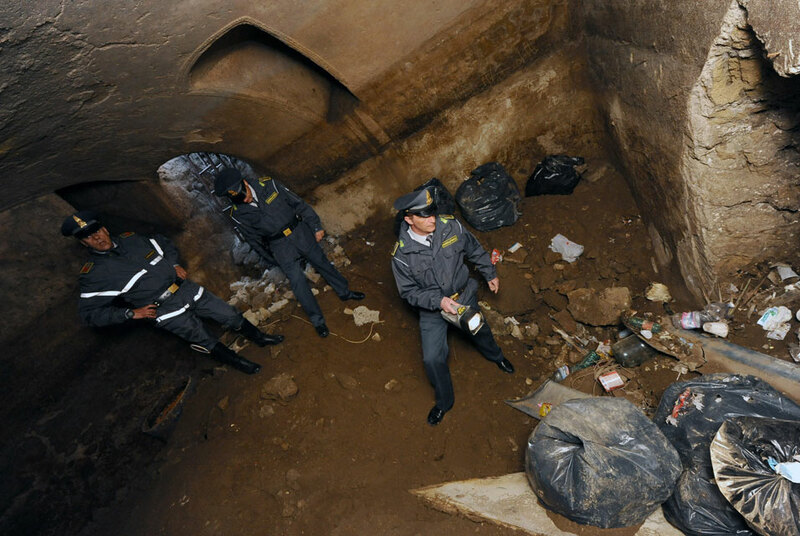 After clearing away a large pile of truck tires, they discovered the entrance to the tomb. When they saw a marble-lined tunnel behind the opening, they realized they had found something ancient and alerted archaeologists excavating a nearby Greek site to the find. Inside the police and archaeologists found a large stuccoed tomb with marble beams in surprisingly good condition despite being filled with trash from the garbage dump, including car batteries. The tomb had already been raided, possibly even recently by the people running the dump so they could sell whatever contents they found then use the empty mausoleum to stuff more trash into. 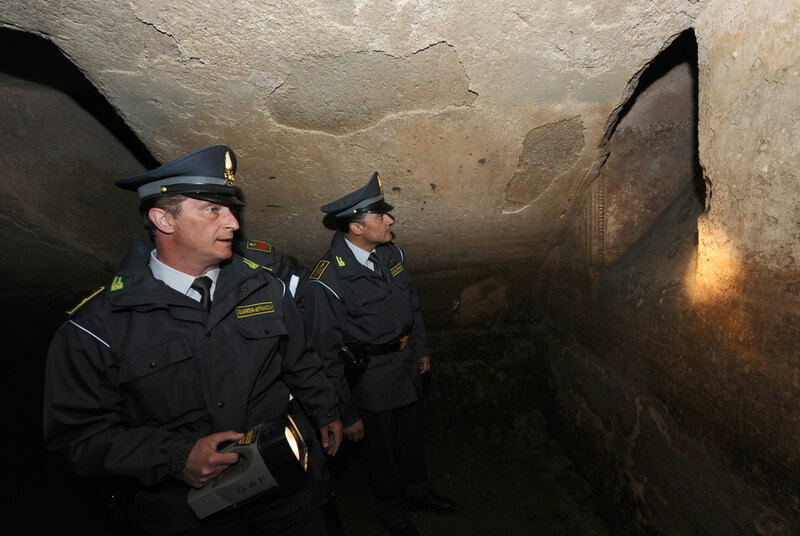 The looters broke into the side of the tomb creating two exits then covered them with tires. The owner of the property and another person who leased the land have been charged with violating environmental and historical preservation laws. Nobody reported the dump or the presence of hazardous waste, including local officials, so police intend to investigate who intentionally looked the other way in dereliction of their duty. Sadly, this isn’t the first time this same site has been used as a trash dump. Organized crime figures were charged years ago for illegally dumping trash there, but obviously it didn’t take. Naples is drowning in garbage, and the Camorra, the regional mafia, are behind many of the illegal dumps that have arisen all over an area rich in Greek and Roman heritage. A 33-foot-long hand-drawn plan of the Titanic that was used in the British Board of Trade’s inquiry into the ship’s sinking in 1912 is going on display in Belfast City Hall over the Easter weekend, from April 23 to April 26. It is privately owned, so this the first time it’s been displayed publicly since the inquiry. Drawn by White Star Line architects in India ink on a single piece of paper, the plan is a cross-section scaled to 3/8 of an inch to the foot. It shows all of Titantic’s main features, from passenger cabins to cargo holds and boiler rooms. It was created to give the inquiry commissioners a detailed picture of the ship’s construction, and includes copious notes and red and green chalk marks on the hull where witnesses and officials marked where they thought the iceberg had penetrated five of Titanic’s watertight bulkheads. One of the witnesses was Guglielmo Marconi, inventor of the radio and the wireless telegraphy system which Titanic was one of the first ships to use. Another was Ernest Shackleton, Arctic explorer of recent whisky fame, who testified as an expert in navigating icy waters. Complete transcripts of the Board of Trade’s inquiry have been put on online at the Titanic Inquiry Project website, along with transcripts from the US Senate’s inquiry, and depositions from the lawsuit against the Oceanic Steam Navigation Company, the White Star Line’s parent company. It’s a treasure trove for Titanic buffs, of course, but also for general history nerds like yours truly. You can read Shackleton’s testimony here, and Marconi’s here (my favorite part is where he talks about the newly created S.O.S. standard for distress signals). The plan will be displayed along with over 250 other items of Titanic and White Star Line memorabilia from specialist White Star Line auctioneers Henry Aldridge and Son. The drawing will then go up for auction on May 31, to coincide with the 100th anniversary of Titanic’s launch on May 31st, 1911. There will be other exhibits and events held by the Belfast City Council as part of their commemoration of the launch, the “Titanic 100” festival, including lectures, film viewings, tours of the Belfast shipyard where Titanic was built, photographs chronicling the building of Titanic and more.